"Pissouri is a beautiful, laid-back resort perfect for a quiet, chilled holiday with its unspoiled nature, stunning beaches, friendly people and great food!" Pissouri is truly the most picturesque village in Cyprus. Set on a hill overlooking the beautiful greenery of vineyards and fields. Pissouri is centrally located, providing access to a gorgeous sandy beach, while also being close enough to the major tourist centres of Paphos and Limassol. The Blue Flag awarded Pissouri Bay, is blessed with 2km of sand & shingle beaches surrounded by a generous helping of white cliffs and sweeping vineyards. The stunning village is the ideal location for total peace and relaxation. Famous for its grape production, it ensures there is a good array of local wines and delicious sultanas to be eaten. There is plenty to do, with a number of excellent dive centres, offering the chance to explore all the magic that is submerged just beneath the surface of the sea, ideal for anyone on a family holiday looking for an adventure. It is also renowned for its sea cliffs, allowing more active guests to go on hikes that reward you with spectacular views over the Mediterranean Sea. 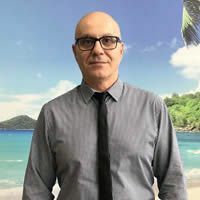 Additionally, it is ideal for families and people who want a slightly more laidback, authentic and relaxing tourist experience; the kind of place where you relax on the beach during the day and then sample the delicious local cuisine during the evening. Pissouri is an idyllic village that sits between the two major tourist hubs of Limassol (38 km) and Paphos (35.8 km). It is situated on the coast providing access to a number of sandy beaches, imposing sea cliffs and the sparkling blue waters of the Mediterranean Sea. 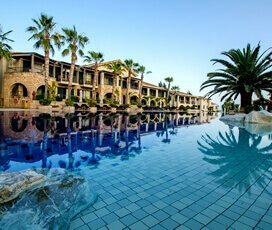 Its location is a strength and its proximity to two major tourist centres makes it a great base from which to explore the rest of Cyprus. It is most easily accessible from Paphos International Airport, just 27.5 km away, which translates to around a 25-minute drive. Blessed with a Mediterranean climate, it has hot dry summers and mild winters, with temperatures ranging from 8°C in winter and highs of 30°C in summer. 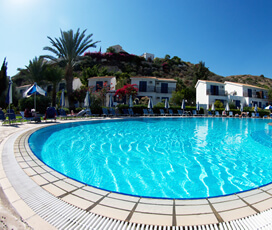 Hot weather comes to Pissouri in April, with temperatures regularly rising over 18°C, though sun worshipers are best waiting until late May, when the temperature averages over 20°C. As with many places the hottest time of the year is from June, to August when temperatures regularly sit in the mid-20's and rarely fall below 20°C. The wettest month of the year in Pissouri is March, and the summer tends to end in late October early November. The small village dates back to the Byzantine era, with the origin of its name a topic of hot debate within the town, with some claiming that it is a derivative of the ancient town of Voousoura. Others argue that it comes from the Greek for ‘very dark' - a not so subtle allusion to the secrecy which was an absolute necessity at the beginning of the Christian era. The final and most likely theory states that it comes from the word ‘pissa', meaning resin, as this was the principle product the town produced during the Byzantine and Frankish eras. When visiting the village try its specialities such as its grapes. These are either made into sultanas, a kind of dried grape, along with a large number of delicious local wines, which can be drank all year round but are particularly tasty in the summer. Pissouri also offers the full range of traditional Cypriot cuisine, including Greek-style salads, light mezes, tasty kebabs and classic Mediterranean fish dishes. The olive oil is also particularly good in the area, as olives share many of the conditions that are required for growing grapes. Pissouri is also an international place, where you will find plenty of Italian and Asian restaurants, ensuring there is something for every taste. A secluded and safe village, it provides exciting children's activities. Pissouri is also located between Limassol (38 km) and Paphos (35.8 km), two places that offer a plethora of children focussed activities, including The Eagle Mountain Ranch, the Super Aphrodite Waterpark and Looney Land in Paphos, along with Limassol Zoo and the Watermania Waterpark in Limassol. Pissouri and the nearby places celebrate a number of festivals throughout the year. Foremost of these is the grape festival, which takes place during July and August annually and celebrates the grape harvest, during it the whole village comes together and dines at trestle tables in the village square. ‘Kataklysmos', known as the Festival of the Flood is celebrated 50 days after Easter throughout Cyprus and involves a number of water-based competitions and games at all major harbours. If you are willing to travel then, both Paphos and Limassol have numerous festivals, including the Limassol carnival in March and the Paphos Aphrodite Festival in September. Its great range of different tours and attractions, are centred around nature and history. Pissouri Beach and the surrounding area host a variety of different diving schools, including the ‘Pissouri Bay Divers' and ‘Cyprus Diving Adventures', both of which offer lessons and diving experiences that allow visitors to experience all the magic that the sea has to offer. There are also many historically significant churches in the area, including the ‘Apostles Andreas Church' and ‘Ayios Mavrikos Chapel', while more active visitors may want to hike around the cliffs and surrounding area. Known as a relatively quiet village, its nightlife is primarily centred around the hotels and village restaurants and pubs, which are ideal for friends and family who want to relish their evenings in a relaxed setting. Both Paphos (35.8 km) and Limassol (38 km) have more vibrant club and bar offerings for those who are willing to travel.